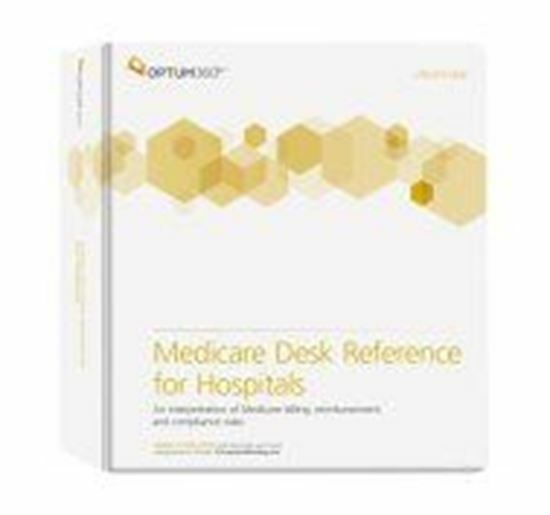 Developed to simplify your day-to-day operations, the Medicare Desk Reference for Hospitals answers the most frequent and vital questions about the Medicare program and its impact on your revenue cycle. This all-in-one reference provides hospitals and hospital systems with quick access to information that will improve management of Medicare coverage, billing, and payment policies for Medicare Part A and Part B services. Optum360 Edge—Access the most up-to-date information concerning Medicare Part A and Part B services for hospitals. Optum360 experts actively and vigilantly track and analyze changing Medicare rules and regulations and consolidate them into this robust reference so that you can make the best decisions for your facility. A-to-Z desk reference format written in plain English. Quickly locate answers to your most important billing and compliance questions along with information about the rules affecting Medicare inpatient and outpatient services. In-depth guidance directed at Medicare’s billing and fraud issues. Get answers to the high-risk and complex billing questions affecting your hospital or hospital system. Icons identify risk areas. Easily identify services that fall under medical review policies or fraud alerts, as well as common claims processing issues. These icons help prevent costly Medicare billing errors, reduce claim denials, and minimize fraud and abuse risks associated with revenue cycle processes in the hospital. Updated twice per year. Stay current with the complex and frequent changes to Medicare and the regulatory changes that may affect your Medicare program participation. Outpatient Prospective Payment System (OPPS) Information. Provides narrative explanations for OPPS regulatory requirements, direct links to the original CMS source documents, and operational strategy for management, auditing, and consulting. Now you can access the entire history, original source documents, and the intent of OPPS in a single place.